John Hood : The Women of Somoa, 1910. Hood's article is accredited "Ensign John Hood U. S. N."
This is a collection of magazine excerpts on Hawa'i and Somoa, apparently collected by "Vignaud." There is no title page and the work is dated 1862 (probably based on the the article by Jules Remy) by the Internet Archive catologuer, but this is clearly incorrect. It is dated here as 1910, based on Hood's book of that year. George H. Bates. 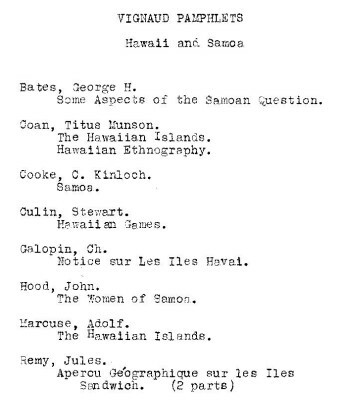 Some Aspects of the Samoan Question, . Ch. Galopin. Notice sur Les Iles Havai. Adolf Marcuse. The Hawaiian Islands. Jules Remy. Apercu Géographique sur les Iles Sandwich, December 1862. 1839 M. Jules Remey : Redwood Flotsam on Oahu. Extract from Contributions of a Venerable Savage, Translated from the French by William T. Bingham, [Boston], 1868. 1899 Stewart Culin : Hawaiian Games. American Anthropologist, Volume 1, Number 2, April 1899, pages 201, 212 and 213. 1892 Adolf Marcuse : Surf Riding in Hawai'i. Extracts from an article collected in the Vignaud Pamphlets: Hawaii, Samoa, . All are accomplished canoeists and expert swimmers, and they do not hesitate to go out in the bays and inlets in their frail little canoes — that will swamp in the slightest sea — in nearly every kind of weather. with horror to see a Samoan mother paddling placidly along in her small canoe, with perhaps three or four children in it scarcely large enough to walk. The waves wash over the little craft, till it is completely swamped. Then, the children drop out and paddle around in the water, while the woman empties the canoe by shoving it backward and forward with one hand, perhaps holding one little fellow too small to swim in the other. When it is empty they crawl in again— a feat that can only be accomplished by one skilled in the art — and paddle on again as unconcernedly as ever, none the worse for the ducking but the cleaner for the bath. Indeed, they are as much at home in the water as on land, a fact which any one will find out to his cost if he enters into their water sports, unless he is a most accomplished swimmer. Geoff Cater (2013) : John Hood : The Women of Somoa, 1910.